The Toyota Yaris features a well-sized European-styled car with wind-deflecting aerodynamics for zooming around town in Lakeland, FL or taking off on that spur-of-the-moment getaway. Inside, this well-made vehicle offers a roomy, quiet cabin with soft-touch materials along with Toyota’s Entune infotainment system. Behind the back seats, there’s as much as 15.6 cubic feet of carrying space (for the five-door model), which increases considerably when the seatbacks are lowered. Under the hood, you’ll choose between the five-speed manual or four-speed automatic transmissions. Even more -- It’s the only car in its class that offers a choice of a three- or five-door hatchback. This year’s Yaris shows off a fresh, modern, and assertive styling and introduces two new color combinations -- pairing Crushed Ice or Barcelona Red with a Black Sand Pearl Roof. Functionality, frugality, and fun merge in the 2016 Toyota Yaris. If you live Brandon or Plant City, stop by Lakeland Toyota in Central Florida and check out the Yaris today! 2016 Yaris comes in three models: the Yaris base L, the mid-level LE, and the sporty SE. At the base level, the Yaris L features a split folding rear seat, height-adjustable driver's seat, and an Entune Audio system, a 6.1-inch touchscreen, HD Radio, a USB port, six speakers, voice recognition, and auxiliary input. The Bluetooth audio streaming and Bluetooth hands-free calling are also included. Navigation is now a dealer or port-installed option. The Yaris L also includes power locks, mirrors, and windows; a rear-window defogger wiper; air conditioning; and plastic wheel covers over steel wheels. The 2016 vehicles also include a height-adjustable driver's seat and a split-folding rear seat. Moving up the Yaris LE adds cruise control, keyless entry 15-inch alloy wheels, and audio controls on the steering wheel. An optional navigation system is also offered on the Yaris -- it's not factory installed but installed either at the dealership or the port. 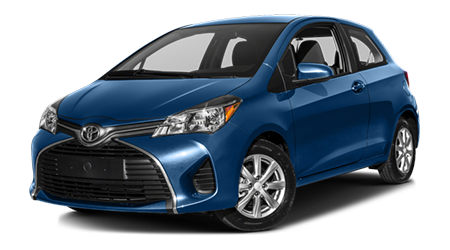 2016 Yaris hatchback features a smooth-revving 1.5-liter four-cylinder DOHC engine equipped with variable valve timing with intelligence (VVT-i) that produces 106 horsepower and 103 pound-feet of torque. The EPA rating for 2016 Toyota Yaris features 30 miles-per-gallon in the city and 37 miles-per-gallon on the highway for a 33 miles-per-gallon rating combined. The Smooth-shifting five-speed manual version made smoother by a hydraulic clutch rates at a similar 30 miles-per-gallon in the city and 36 miles-per-gallon on the highway for an estimated 32 miles-per-gallon combined. A four-speed electronically controlled automatic transmission that features a compact, lightweight design and low friction for high fuel efficiency is also available. 2016 Yaris packs a lot of big safety into a small bundle. Protection with a collision begins with an impact-absorbing body formation that makes ample use of the Sturdy high-tensile steel to absorb successfully and dispense collision energies. The 2016 Yaris models have nine airbags, including front passenger and driver dual-stage airbags, front seat cushion airbags, front seat side airbags, side curtain shield airbags, and driver’s knee airbag. The 2016 Yaris, like all Toyota vehicles, features the Star Safety System™, which includes: Vehicle Stability Control, Traction Control, Anti-lock Braking System, Electronic Brake-Force Distribution and Brake Assist, and Smart Stop Technology. The Advanced Whiplash Injury-Lessening front seat construction aids and ensures that the region from the head to the lower back are both equally supported. This system helps to reduce any whiplash-type injuries during specific types of rear-end accidents. Toyota infused the new-generation 2016 Yaris with a sense of solidity and excellence throughout the vehicle. That sensation carries through to even the smallest of details that make a satisfying sense of ownership. For example, the glovebox control allows the compartment open with an ease normally seen on luxury models. Vanity mirrors and the dual extendable sun visors are an extra-nice touch that entry cars usually leave out of the equation. The Yaris cabin scheme clearly delineates the driver and front passenger areas, and the instrument gauge collection conveys a sporty purpose. Below the huge speedometer, an LCD multi-information display screen includes functions for an odometer, clock, trip meter, outside temperature, average speed and fuel economy. The Toyota Yaris showcases a well-crafted European styled vehicle with wind-resistant aerodynamics for cruising around town or taking off on a road trip. The interior features a spacious, quiet cabin with soft-touch fabric and Toyota’s Entune infotainment system. Come into Lakeland Toyota and test drive the new Yaris. We welcome our neighbors in nearby Brandon and Plant City!